Research has established that individual student interest has a positive effect on learning and academic achievement. However, little is known about the impact of a blended learning ap-proach on individual student interest and whether combinations of online and face-to-face learning activities significantly enhance student interest. This paper assesses the effect of blended learning on perceived individual student interest, utilizing a blend of online and face-to-face discussions. The study employed a quasi-experimental design consisting of two differ-ent treatment groups, online discussions versus face-to-face discussions. Data were analyzed using the t-test technique. Results from the study suggest that there was no statistical differ-ence in subjects’ perception of interest in both the online and face-to-face discussions. How-ever, from observation, subjects in the online discussions were eager to engage in textual dia-logue and therefore, participated more in the discussions compared to the face-to-face discussions. Shroff, R. & Vogel, D. (2010). An Investigation on Individual Students’ Perceptions of Interest Utilizing a Blended Learning Approach. 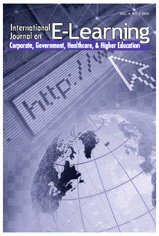 International Journal on E-Learning, 9 (2), 279-294. Waynesville, NC USA: Association for the Advancement of Computing in Education (AACE). Retrieved April 23, 2019 from https://www.learntechlib.org/primary/p/29282/. Amabile, T.M. (1996). Creativity in context. Boulder, Co: Westview Press. Bonk, C., & Graham, C. (2005). Handbook of blended learning: Global perspectives, local designs. San Francisco, CA: Pfeiffer Publishing. Bosworth, K., & Hamilton, S.J. (1994). Collaborative learning: Underlying processes and effective techniques. San Francisco: Jossy-Bass. Boyle, T. (2005). A dynamic, systematic method for developing blended learning. Education, Communication and Information, Special Issue on Blended Learning, 5(3), 221-232. Boyle, T., Bradley, C., Chalk, P., Jones, R., & Pickard, P. (2003). Using blended learning to improve student success rates in learning to program. Journal of Educational Media, 28(2-3), 165-178. Cochran, W.G. (1963). Sampling techniques (2ed.). New York: John Wiley and Sons, Inc.
Collins, A. (1990). Cognitive apprenticeship and instructional technology. In Idol, L. And B.F. Jones (eds. ), Educational values and cognitive instruction: Implications for reform. Hillsdale, NJ: Lawrence Erlbaum Associates. Deci, E.L., & Ryan, R.M. (1992). The initiation and regulation of intrinsically motivated learning and achievement. In A.K. Boggiano, & Pittman, T.S. (Eds. ), Achievement and motivation: A social-developmental perspective. (pp. 77-114). Cambridge: Cambridge University Press. Dede, C. (1996). Emerging technologies in distance education for business. Journal of Education for Business, 71(4), 197-204. Dewey, J. (1913). Interest and effort in education. Boston, Massachusetts: Houghton Mifflin C.
Edelson, D.C., Pea, R.D., & Gomez, L. (1995). Constructivism in the collaboratory. In Constructivist learning environments: Case studies in instructional design. Englewood Cliffs, NJ: Educational Technology Publications. Garrison, D.R., & Kanuka, H. (2004). Blended learning: Uncovering its transformative potential in higher education. The Internet and Higher Education, 7(2), 95-105. Harp, S.F., & Mayer, R.E. (1997). The role of interest in learning from scientific text and illustrations: On the distinction between emotional interest and cognitive interest. Journal of Educational Psychology, 89, 92-102. Harter, S., & Connell, J.P. (1984). A model of children's achievement and related selfperceptions of competence, control and motivation orientation. Advances in Motivation and Achievement, 3, 219-250. Hidi, S., & Anderson, V. (1992). Situational interest and its impact on reading and expository writing. In K.A. Renninger, S. Hidi, and A. Krapp (Eds. ), The role of interest in learning and development. Hillsdale, NJ: Lawrence Erlbaum Associates. Hidi, S., & Berndorff, D. (1998). Situational interest and learning. Paper presented at the Proceedings of the Seeon-Conference on interest and gender, Kiel, Germany. Hiltz, S.R. (1990). Collaborative learning: The virtual classroom approach. Technological Horizons in Education Journal, 17(10), 59-65. Iran-Nejad, A. (1987). Cognitive and affective causes of interest and liking. Journal of Educational Psychology, 79, 120-130. Jonassen, D., Peck, K., & Wilson, B. (1999). Learning with technology: A constructivist perspective. Upper Saddle River, NJ: Merrill Publishing. Krapp, A., Hidi, S., & Renninger, K.A. (1992). Interest, learning and development. In K.A. Renninger, S. Hidi & A. Krapp (Hg. ), The role of interest in learning and development. Hillsdale, NJ: Erlbaum. Leidner, D.E., & Jarvenpaa, S.L. (1995). The use of information technology to enhance management school education: A theoretical view. MIS Quarterly, 19(3), 265-291. Malone, T. (1981). Toward a theory of intrinsically motivating instruction. Cognitive Science, 3, 333-369. Malone, T., & Lepper, M. (1987). Making learning fun: a taxonomy of intrinsic motivations for learning. In Aptitude, Learning and Instruction, Volume 3, Cognitive and Affective Process Analyses. New Jersey: Lawrence Erlbaum. Mitchell, M. (1993). Situational interest: Its multifaceted structure in the secondary school mathematics classroom. Journal of Educational Psychology, 85, 424-436. Moore, G., & Benbasat, I. (1991). Development of an instrument to measure the perceptions of adopting an information technology innovation. Information Systems Research, 2(3), 192-222. Murphy, P.K., & Alexander, P.A. (2000). A motivated exploration of motivation terminology. Contemporary Educational Psychology, 25, 3-53. Novak, G., Gavrin, A., Christian, W., & Patterson, E. (1999). Just-in-time teaching: Blending active learning with web technology. New York: Prentice Hall Series in Educational Innovation. Ocker, R., & Yaverbaum, G.J. (2002). Collaborative learning environments: Exploring student attitudes and satisfaction in face-to-face and asynchronous computer conferencing settings. Journal of Interactive Learning Research, 12(4), 427-448. Osguthorpe, R., & Graham, C. (2003). Blended learning environments definitions and directions. The Quarterly Review of Distance Education, 43(3), 227-233. Parker, L., & Lepper, M. (1992). The effects of fantasy contexts on children's learning and motivations; making learning more fun. Journal of Personality and Social Psychology, 62, 625-633. Ranwez, S., Leidig, T., & Crampes, M. (2000). Formalization to improve lifelong learning. Journal of Interactive Learning Research, 11(3/4), 389-409. Reeve, J., & Deci, E. (1996). Elements of the competitive situation that affect intrinsic motivation. Personality and Social Psychology Bulletin, 22(1), 57-71. Renninger, K.A. (2000). Individual interest and its implications for understanding intrinsic motivation. In C. Sansone & J.M. Harakiewicz (Eds. ), Intrinsic and extrinsic motivation: The search for optimal motivation and performance. New York: Academic Press. Ryan, R.M. (1994). The Nature of the self in autonomy and relatedness. In J. Strauss& G.R. Goethals (Eds. ), The self: Interdisciplinary approaches (pp. 208-238). New York: Springer-Verlag. Ryan, R.M., & Deci, D.L. (2000). Intrinsic and extrinsic motivations: classic definitions and new directions. Contemporary Educational Psychology, 25, 54-67. Schiefele, U. (1999). Interest and learning from text. Studies of Reading, 3(3), 257-279. Thorne, K. (2003). Blended learning: How to integrate online and traditional. London: Kogan Page. Vansteenkiste, M., Simons, J., Lens, W., Sheldon, K.M., & Deci, E.L. (2004). Motivating learning, performance and persistence: The synergistic effects of intrinsic goal contents and autonomy-supportive contexts. Journal of Personality and Social Psychology, 87, 246-260. Venkatesh, V. (2000). Determinants of perceived ease of use: Integrating control, intrinsic motivation and emotion into the technology acceptance model. Information Systems Research, 11(4), 342-365.